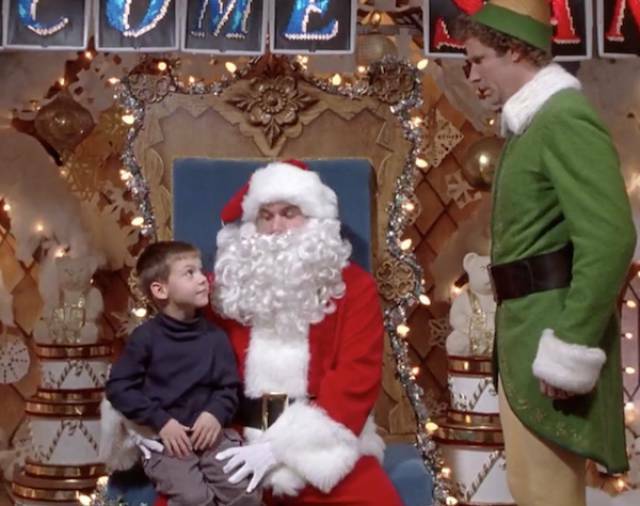 When the film’s first script was produced in 1993, Jim Carrey was originally attached to play the role of Buddy. 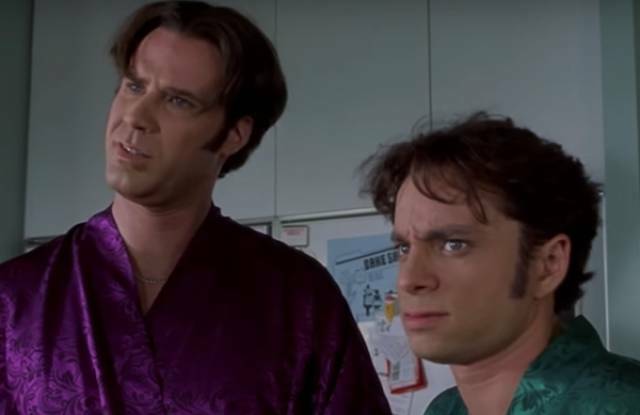 However, 10 years later (when the film was finally ready to go into production), Carrey was replaced by SNL star Will Ferrell and the rest, as they say, is history. 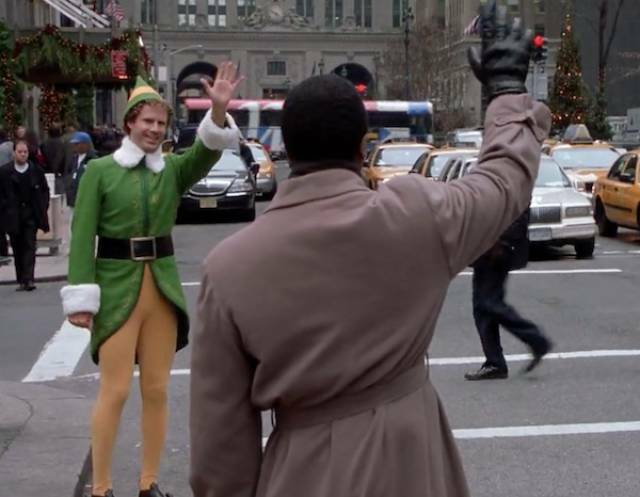 The scenes where Buddy first arrives in New York and ‘interacts’ with the locals were shot using just the director Jon Favreau, Ferrell and one cameraman. They drove around New York, jumping out at certain spots to film quick segments and paying the bemused New Yorkers with cash. However, the majority of the film was shot on sound stages in Vancouver. 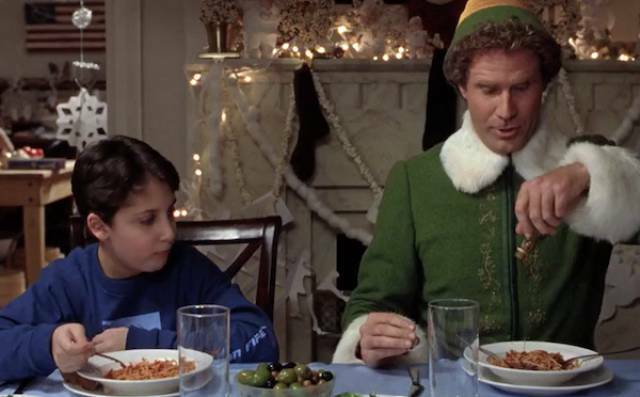 Ferrell really did consume the vast amounts of sugar his character Buddy so craved; so much so in fact that he had trouble sleeping all throughout production and was continuously plagued by headaches. 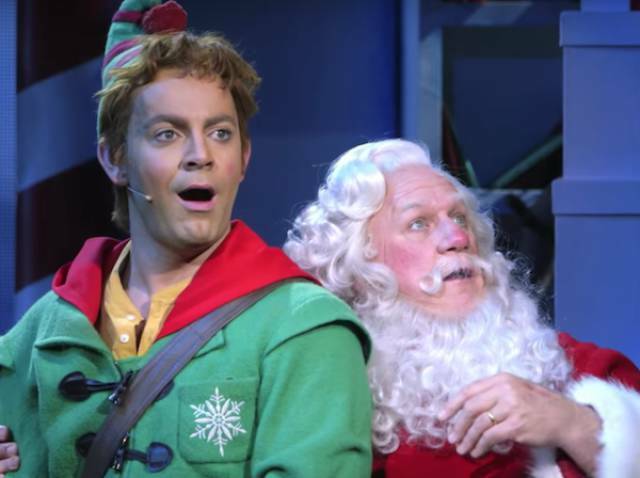 The scene in which Buddy fights the ‘Fake Santa” had to be done all in one shot, such was the devastation caused by their festive fisticuffs. 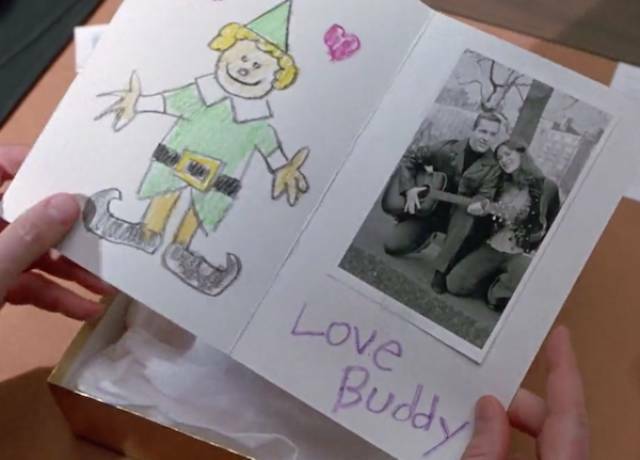 The crayon self-portrait Buddy draws in the card to his father was, in fact, the work of director Jon Favreau. Buddy’s epic burp was the work of voice artist Maurice LaMarche, who you may know better as ‘The Brain’ from the 90’s cartoon Pinky and the Brain. 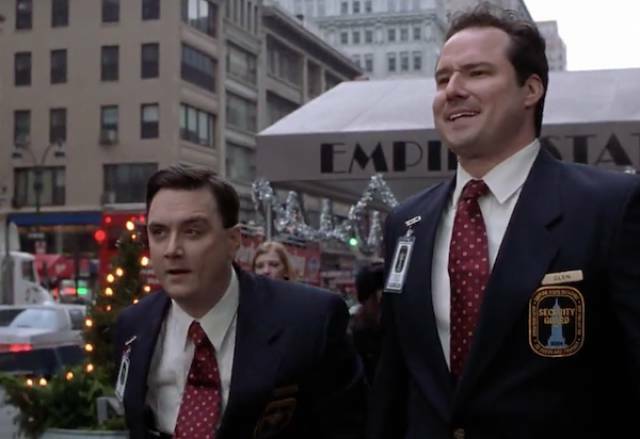 One of the security guards who throws Buddy out of The Empire State Building is Will Ferrell’s real-life brother, Patrick Ferrell. 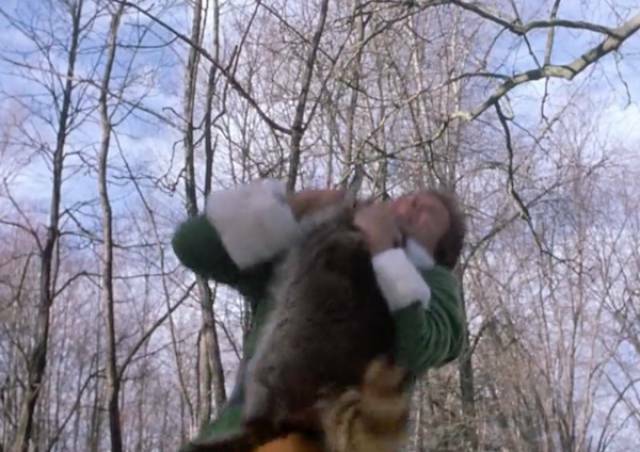 The racoon that attacks Buddy is actually a monkey! (or, more accurately, the sound effect is). 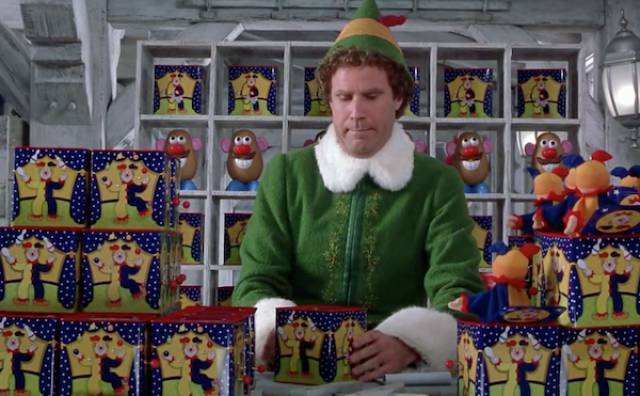 Will Ferrell’s anxiety during the jack-in-the-box toy testing scene was at least partially real, as director Jon Favreau was controlling when ‘the Jack’ would spring forth. 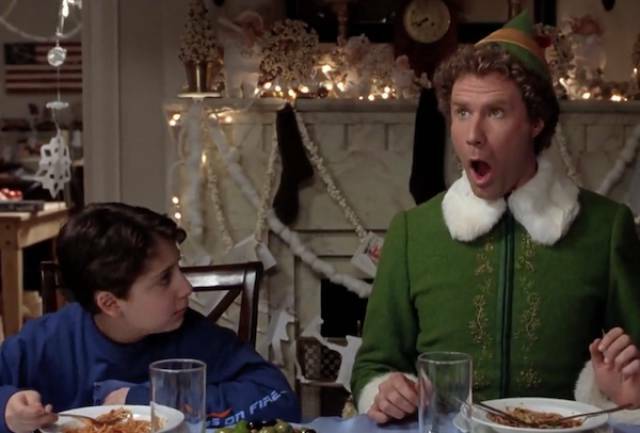 Ferrell’s reactions were relatively authentic. 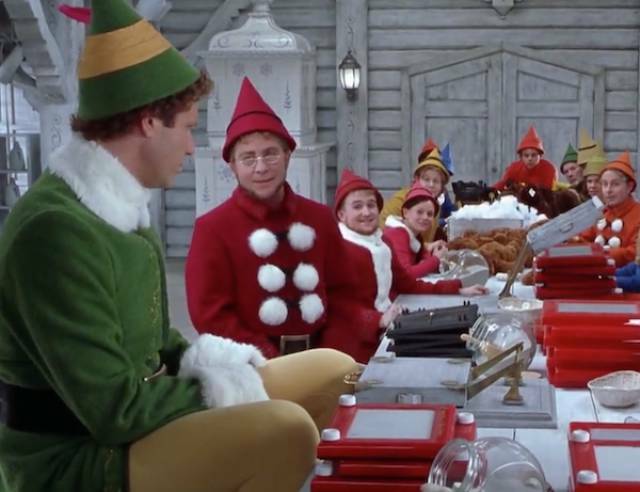 Instead of using CGI, Jon Favreau employed more practical effects (such as forced perspective) for the scenes between Buddy and his elf friends. 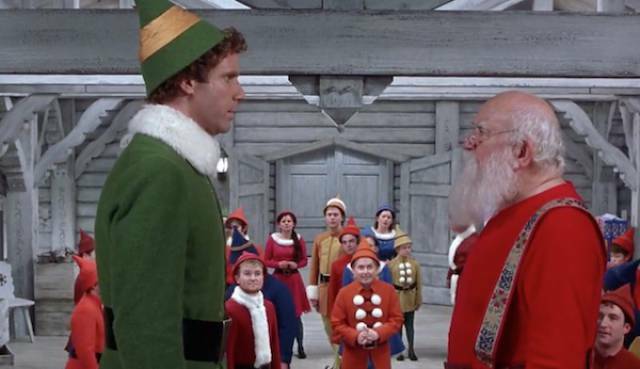 Two sets were built, one little and one large, and then shots artfully blended to contrast both Buddy and Santa with their more diminutive peers. The sound effect the jack-in-the-boxes’ make is the same one the hyenas make in the Lady and the Tramp (1955), the same as the noise Ripper Roo makes in the Crash Bandicoot series of video games, and also can be heard as the sound effect used by the laughing hyenas at the Magic Kingdom at Disney World in Orlando, Florida. 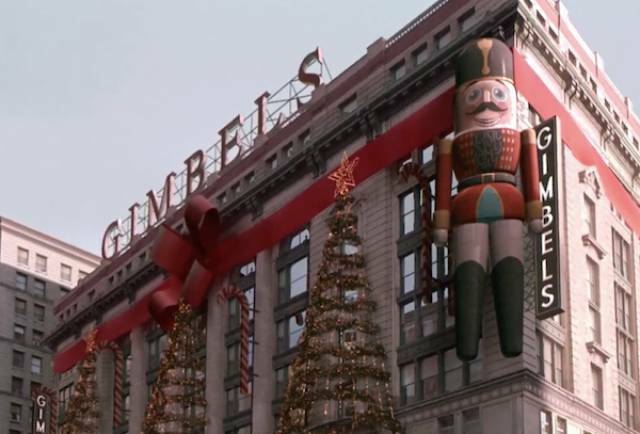 Gimbel’s is actually (and rather predictably) a digitally altered version of Macy’s in Manhattan. The original baby Buddy was fired. 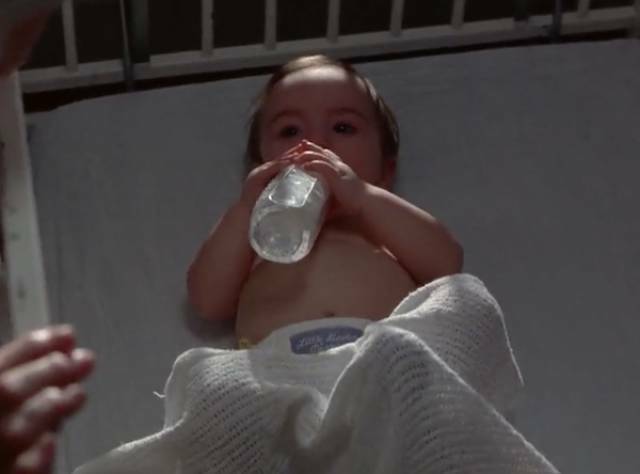 Two blonde curly haired twin boys were the first choice to play the infant version of the excitable title character but wouldn’t do any of the fairly basic demands (don’t cry and do crawl) placed on them and instead did the exact opposite (do cry and don’t crawl). They were replaced by girl triplets who had a more playful, and less emotional, demeanor. 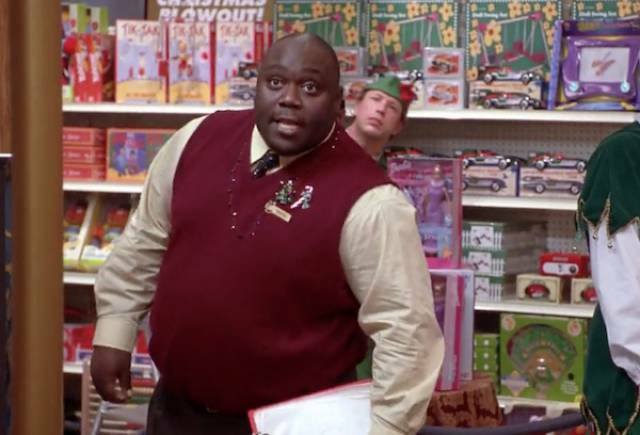 Strangely, the manager of Santa’s Grotto at Gimbel’s name tag reads “Wanda”. 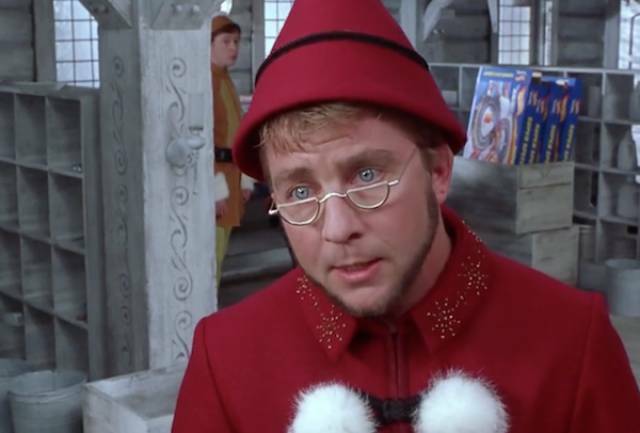 Peter Billingsley, who played Ralphie in the 1983 festive classic A Christmas Story, plays the foreman elf Ming Ming at the start of the film. 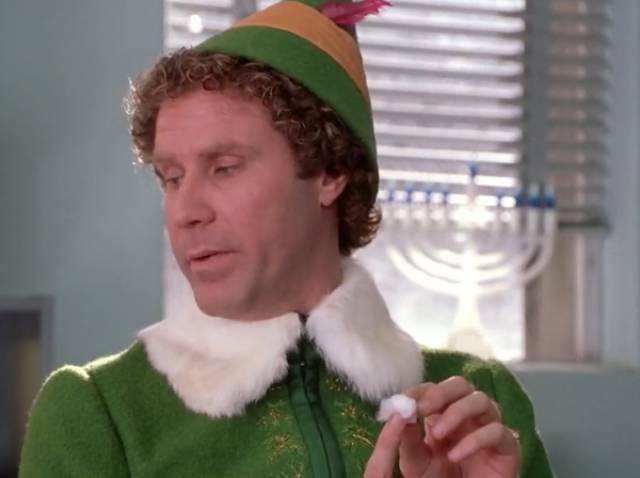 The cotton swabs Buddy consumes at the doctor’s office were in fact uncolored bit of cotton candy. 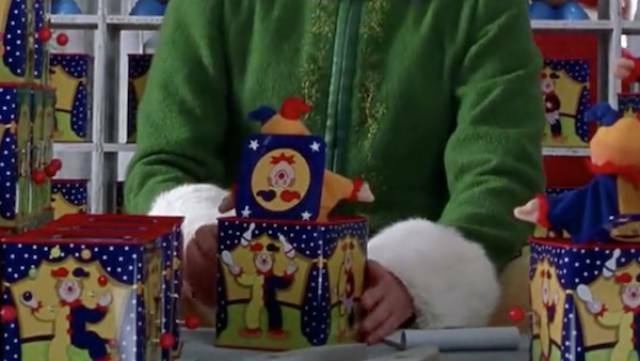 The design for Santa’s workshop, the strange looking talking animals, and the elf outfits were directly inspired by the Christmas animation Rudolph the Red-Nosed Reindeer (1964). 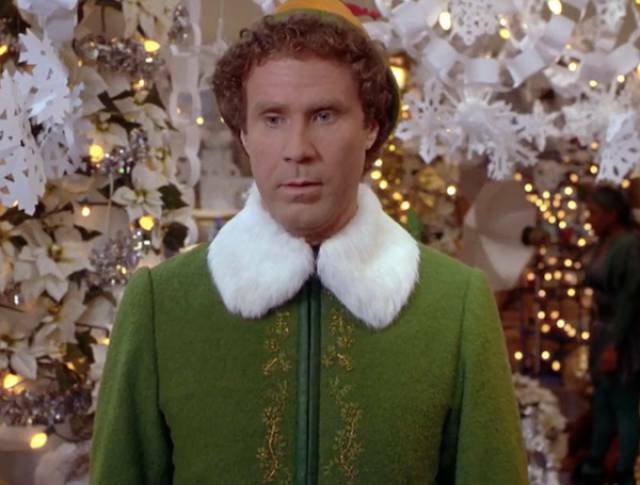 Will Ferrell turned down a reported $29 million to reprise his role for a proposed Elf 2.